It’s been a couple of months since I posted anything about my book The Deep Things of God: How the Trinity Changes Everything, but the book continues to make the rounds and find new readers. Here are some of the most interesting tidbits from recent times. Fred Sanders – “The Deep Things of God” Trailer from Crossway on Vimeo. His core thesis is that the Trinity is inextricably linked to the gospel (and vice versa). His secondary thesis is that evangelicals have a rich trinitarian heritage and that evangelical practices such as witnessing, Bible reading, prayer, and worship are rooted in trinitarian faith. Specifically, Sanders makes at least five contributions through this book. First, he offers profound pastoral advice: the first step in helping Christians become more trinitarian is helping them discover that their lives are already compassed about by the Trinity. He also offers an insightful diagnosis of why evangelicals are weak on the Trinity; namely, because they have lost sight of relationship between the Trinity and the gospel. Second, Sanders offers a rich discussion of the key facets of this doctrine. Particularly helpful are his discussions of the relationship between the immanent and the economic Trinity (the subject of Sanders’s doctoral dissertation); the eternal relations among the divine persons (including his explanations of the eternal generation of the Son and procession of the Holy Spirit); and the missions of the Son and Spirit in the economy of salvation. 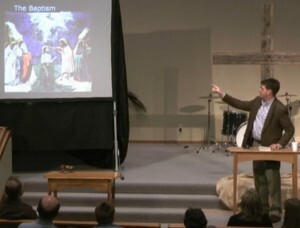 Third, Sanders does a masterful job communicating complex trinitarian concepts to a popular audience and helps evangelical readers understand the importance of classical trinitarian concepts. His diagrams alone are worth the price of book. Fourth, he succeeds brilliantly in demonstrating that an nseparable link exists between the Trinity and the gospel. In my judgment, this represents one of the most important contributions of this book. (Evangelicals who dismiss the eternal generation of the Son on the grounds that this doctrine is speculative and non-biblical will want to take note of the constitutive role this doctrines plays in properly articulating the gospel.) Fourth, Sanders makes a strong case that earlier evangelicals understood the “trinitarian shape” of the gospel, and he calls an impressive array of witnesses to substantiate this claim. Fifth and finally, he succeeds in demonstrating that core evangelical distinctive—such as personal appropriation of salvation, assurance of salvation, and submission to biblical authority—are rooted in trinitarian faith. Frank Viola read and liked Deep Things of God. I was glad to see his overwhelmingly positive review because Viola is famous for a certain style of critique: He believes much of what we take for granted as the right way to do church (buildings, paid pastors, tithing, etc.) is in fact a mass of pagan accretions that have nothing to do with Biblical Christianity. In my experience, people who make that kind of argument tend to toss out the Trinity with the baby-baptism water. But Viola breaks the rule: His version of primitivism or restorationism is decidedly trinitarian. I’m hearing that Deep Things is finding a receptive audience among Pentecostal, Charismatic, and Third-Wave believers. That makes me happy because I intentionally wrote the book to edify all sorts of evangelicals, big-tent style. I’m no charismatic, but I learned my first lessons about the Trinity in a Foursquare church, and I didn’t just feature Nicky Cruz in chapter 1 because he’s good with a switchblade. More details on this story as it develops. While I was at Vimeo for the Crossway trailer, I did a vanity search and found my 20-minute interview with Kevin Swanson of Generations Radio online there. The interview starts at the 8:30 mark. Kind of weird to watch the host but only hear the caller, but there you go. And also at Vimeo you can watch or listen to two and a half hours of my March 2011 talk at the Bridge Church in Snohomish, WA (the sound starts out tinny but improves soon). Here’s a picture of me pointing to Giotto’s painting of the baptism of Christ from the Scrovegni chapel. This part of the talk is fairly leisurely, since I had the whole weekend with this church and this clip is only the Friday night portion of our time.